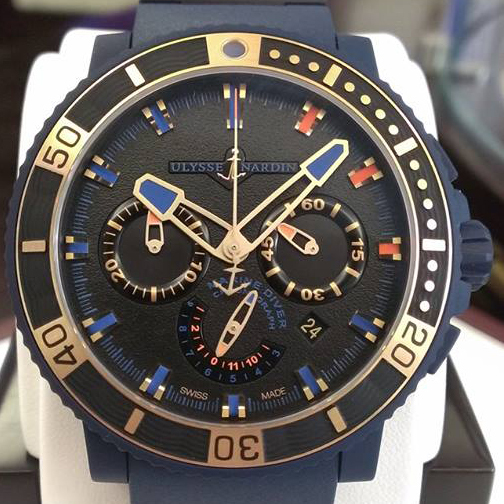 Ulysse Nardin Ref. 263-95LE is entirely performed in marine-related issues: a pattern of waves covers the dial, the rubber strap and even the bezel of the model. The case diameter is 42.7 mm; it is made of steel coated with vulcanized rubber, which makes it possible to give the case black color, but also reliably to protect it from scratches. The crown has protective lugs. The watch water-resistant is 200 meters. The arrangement of the unidirectional bezel is highlighted in gold, as well as the central hand, covered like a dial markings with a dark-gray fluorescent compound. At the position of "12 o’clock" is the indicator of a 42-hour power reserve. And the position of "6 o’clock" has taken by a small seconds hand and mounted into its small dial a round date window. Maxi Marine Diver Boutique Ref. 263-95LE is available on a black rubber strap with two ceramic inserts, on which is engraved Boutique, and a titanium folding clasp. An automatic movement UN-26 on the 28 jewels is visible through the transparent case back. In general, the new watch Maxi Marine Diver Boutique Ref. 263-95LE is a hymn of superiority, as well as the spirit of the famous Marine Ulysse Nardin, which logo is a sea anchor.